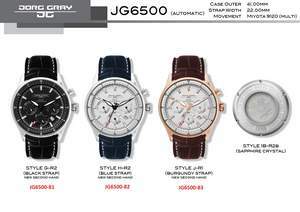 TUSTIN, CA--(Marketwired - Jun 17, 2015) - Jorg Gray -- renowned for crafting exceptional luxury wristwatches offered at an accessible price point, today announced its newest, most innovative timepiece -- the JG6500 Automatic. Recently previewed at JCK Las Vegas, the wristwatch stirred excitement by trade show attendees and exhibitors alike. "We've been working on the JG6500 Automatic for quite some time," says Jorg Gray President Trevor Gnesin, whose company has grown an impressive international footprint. "Inspired by our iconic 6500 design, we are proud of this significant leap forward -- from Swiss movement to Automatic -- and enthusiastically look forward to making this outstanding timepiece available for the 2015 holiday season." Slated for availability early November, Jorg Gray has taken the iconic JG6500 model to the next level with the introduction of the JG6500 Automatic. The new model features a reliable Miyota 9120 multifunction automatic movement (40-hour power reserve, 26 jewels), a flat sapphire crystal with anti-reflective coating, full exhibition back and a solid 316L stainless steel case. Extra details such as the JG embellished second hand and multi-layer dial make this an extraordinary timepiece at the accessible price point of $895. Among the favorite brands of many high-profile celebrities, athletes, political dignitaries, and watch collectors, Jorg Gray takes pride in creating high-quality luxury watches at affordable price points. The JG6500 Automatic, designed for the discriminating metropolitan male who chooses his timepieces instinctively for form, function and style, embodies the very qualities inherent in every Jorg Gray design. Jorg Gray authorized dealers are currently accepting presale orders of the JG6500 Automatic. To find a location near you, visit www.jorggray.com. For more information, please contact Leslie Licano at leslie@beyondfifteen.com or 949-733-8679. ABOUT JORG GRAY: Based in Southern California, the Jorg Gray brand offers a range of unique watches that reflect an effortless American style and sophistication. In response to overwhelming demand, Jorg Gray has recently expanded into a global brand and is the timepiece of choice for the U.S. Secret Service and the President of the United States, as well as a variety of high profile celebrities and athletes. Chic consumers across the globe continue to respond to the Jorg Gray hallmark of exceptional artistry and outstanding value. For more information, visit JorgGray.com.